In my opinion the most important scientific discovery in chemistry is discovering oxygen. Everyone needs oxygen to survive, oxygen is the third most abundant element in the universe and makes up nearly 21% of the earth's atmosphere. Oxygen accounts for nearly half of the mass of the earth crust, two third of the mass of the human body and nine tenths of the mass of water. Oxygen occurs in all kinds of minerals. Oxygen was discovered for the first time by a Swedish chemist in 1772. One important use of oxygen is in medicine, people who have trouble breathing are giving extra doses of oxygen, this keeps people alive after they would otherwise have died. 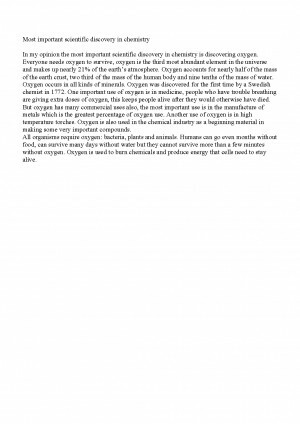 But oxygen has many commercial uses also, the most important use is in the manufacture of metals which is the greatest percentage of oxygen use. Another use of oxygen is in high temperature torches. Oxygen is also used in the chemical industry as a beginning material in making some very important compounds. All organisms require oxygen: bacteria, plants and animals. Humans can go even months without food, can survive many days without water but they cannot survive more than a few minutes without oxygen. Oxygen is used to burn chemicals and produce energy that cells need to stay alive. Descărcarea referatului cu titlul "Chemistry discovery" este gratuită. Completezi informațiile din formularul de comandă și imediat după aceea vei primi prin email link-ul de descărcare.